And so, my kitchen cabinets are finally painted (woot!) and I’m no longer picking through grocery bags for food and measuring cups. The joys of clean, organized and freshly painted kitchen cabinets cannot be overstated, let me tell you! A little recap. My kitchen makeover has been basically a Sunday afternoon project. So, I’ve we’ve (can’t forget my fantastic volunteer staff!) been working since August. 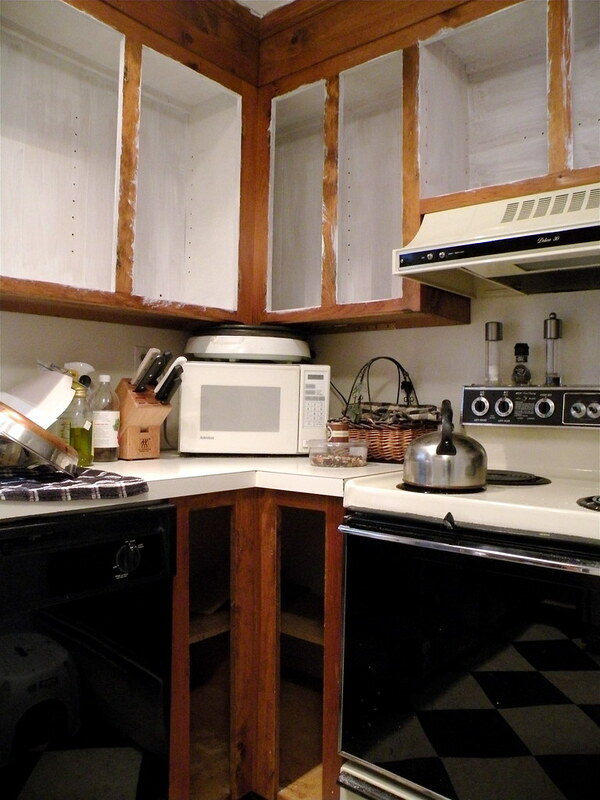 Here are the nasty knotty pine cabinets that I started off with. Lovely, no? Lot’s of cleaning and priming ensued. I painted the insides of the cabinets with Farrow & Ball Cooking Apple Green (with thanks to Brooke Giannetti at Velvet & Linen for the inspiration!) This is Brooke’s living room below, I just loved the backs of the shelves. She used F&B’s Verte de Terre, which I looked at, but eventually I settled on Cooking Apple Green as it was a little less gray. 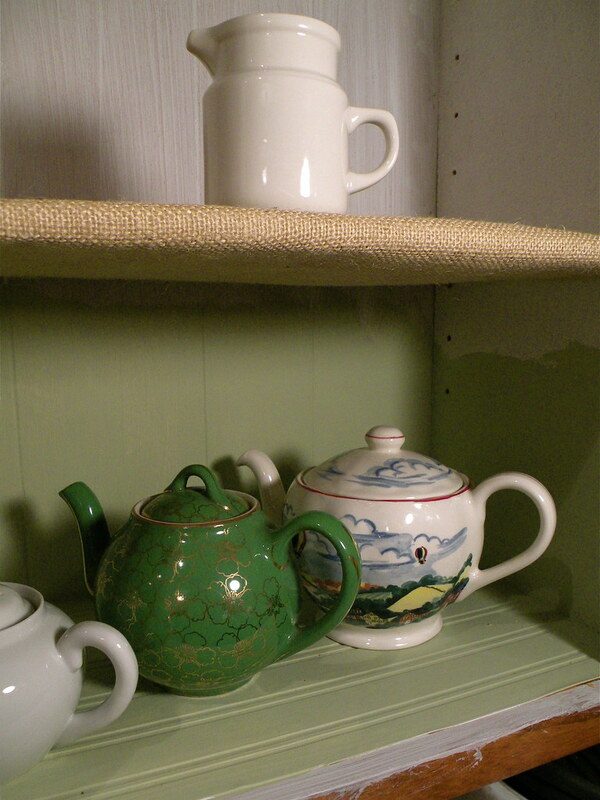 So, here is a test section of the Cooking Apple Green – which I am totally in love with!! I also tested the idea of upholstering the shelves in burlap. The main reason (aside from trying something new!) was that the shelves are nasty particle board, which I thought wouldn’t take the paint well. The results of the wrapped burlap shelves was mixed – some areas were nice an tight, but other’s not so much and the end result wasn’t as tailored as I wanted. I was also thinking I needed to line the cabinet insides with paintable paper – again because of the liberal use of cheap particle board. However, in the end with good priming, they looked best simply painted. As for the exteriors of the shelves, while I veered wildly back and forth between a black paint or a lighter green, I ended up compromising with myself and went with two Benjamin Moore colors: Essex Green with Black Forest Green as the second coat. Both coats were sanded with a fine steel wool with “holidays” left in the paint to achieve an aged look. I also wanted to keep the shine to a minimum. 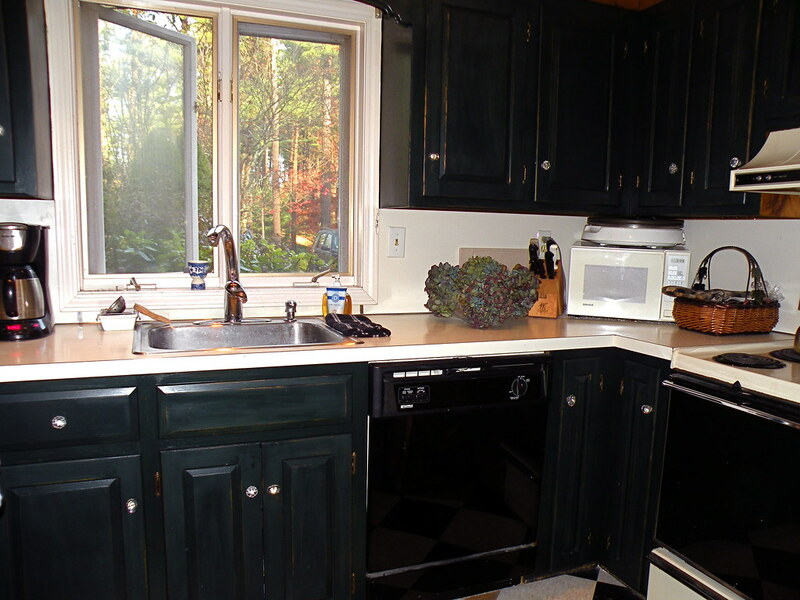 This paint is an exterior trim paint, so it should stand up well to kitchen wear and tear. 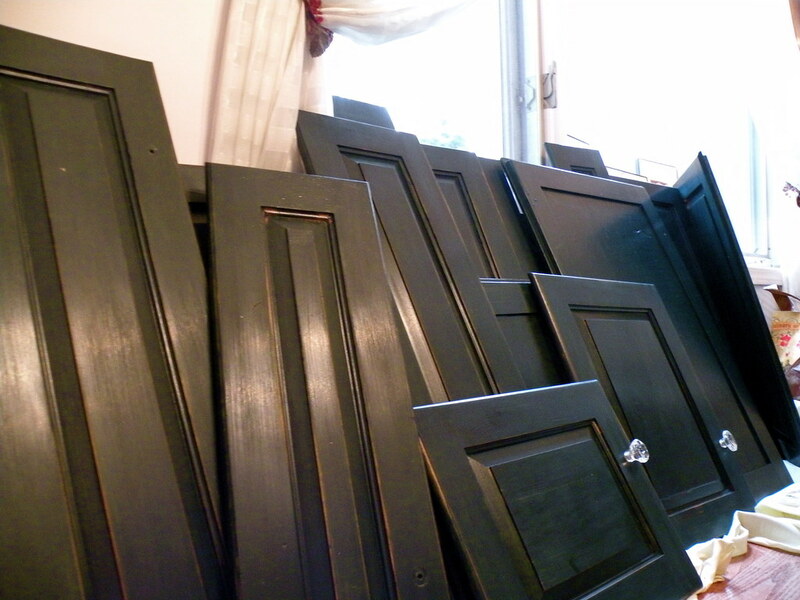 Here are the cabinet doors all finished and lined up waiting to be re-attached to the cabinets! Although I have a very small kitchen, there are still seventeen doors! And only two drawers. Don’t ask. Of course, the final element with the cabinet doors is the hardware. There are so many beautiful choices out there! I decided that with all the work involved in painting the cabinets, they I deserved something special! After all, my manicure was sacrificed for the cause!! In August, I was at an event at the Roomscapes Luxury Design Center in Rockland, MA (see post here) and fell in love with a set of crystal knobs on display. I thought that glass knobs were a great idea to add sparkle and lightness to the dark cabinets (not that they look bad on these beautiful cream cabinets either!). So, I started searching for the perfect knob for my slightly distressed, but not too shabby or ‘kountry’ kitchen cabinets. Something that bridged the divide between upscale and, well, budget. There are some seriously beautiful cabinet knobs out there! Swarovksi “Baldwin” knob – at $38 per knob (on sale). Total for 20 knobs: $760. Considerably more than what I’ve spent on the kitchen to date. So, nope. These totally over the top Cache knobs and escutcheon’s sport Swarovski crystals and are fabulously jewelry-like. And, honestly, at $30 per set, not bad. But, not the look or price tag I seek. These Quartz Crystal knobs are pretty, but still, at $20 each, we’re looking at $400 for the kitchen. These very pretty German Crystal knobs are beautiful and I love the facets – sparkly! Currently priced at $15 each, we’re in the $300 range for the knobs. 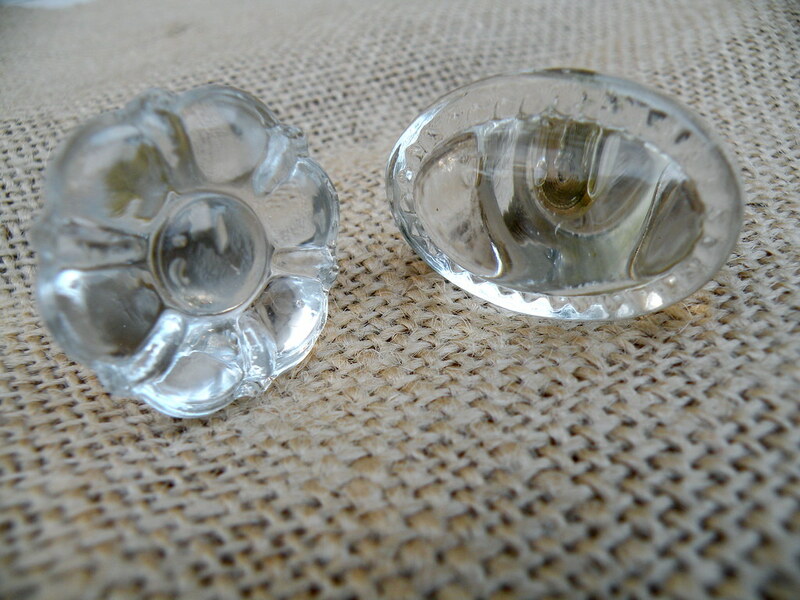 These Restoration.com glass knobs are lovely – elegant and simple. At $11.80 each theyre a $230+ budget item. Vintage inspired “Astoria” knob at $6 each. 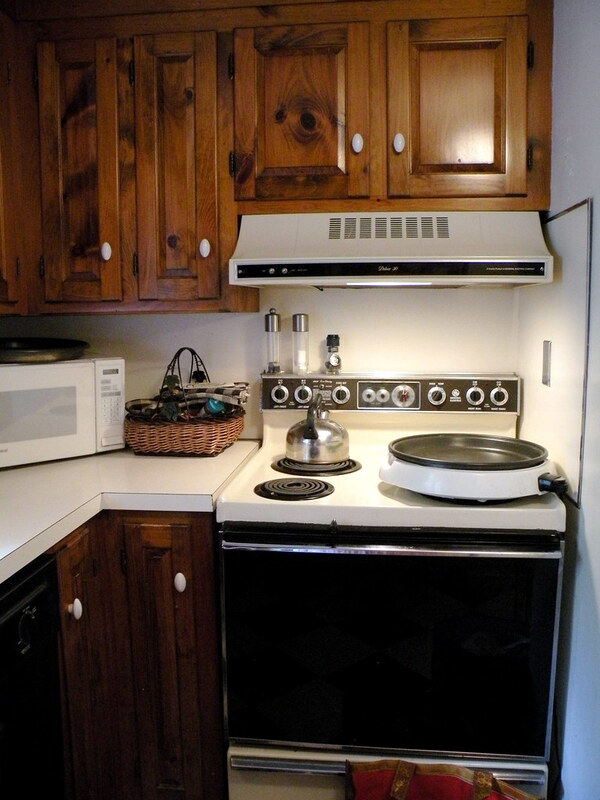 $180 for entire kitchen. Of course, glass knobs come in a variety of fabulous colors! These from Looking in the Attic are also about $6-7 per knob. Pretty, but I don’t like the visible post. Love them, love everything about them. And since I couldn’t decide, I picked two different styles and are using them both! Here is a link to the oval knob , unfortunately, I can’t find the link to the flower, but it was the same seller. At less than $2 each, the final cost was a trés budget friendly $50 for the whole kitchen, including shipping. There is still a lot more work to come. The soffit over the cabinets needs to be painted, as do the walls (not shown in pic), and the backsplash needs to be dealt with. And, all new appliances are coming in a couple of weeks, courtesy of Ferguson Appliance. I think the stainless appliances will be a nice balance against the dark cabinets and I’m looking forward to my checkerboard floor NOT being reflected in the shiny black dishwasher and stove fronts! Looks great. love the cooking apple green. Wonderful. Enjoy the fruits of your labor!!!! WOW, thanks Linda! What a beautiful remodel, so impressive…I am now thinking about redoing mine in the temp condo I am staying in. So you did ALL of this for less than $1000? Unbelieveable, congratulations on a job well done! I have to say Linda, I am leaning toward a greenish / black color for my kitchen as well either that or brownish / black. I am loving the darker with more lighter walls and counters. Your remodel turned out wonderfully! Everything looks great! I can't wait to see everything finished! wowowowowow!!! You did a fabulous job. I know it makes you feel happy to go into your kitchen and with the new appliances it will be fab! Oh…I forgot to mention how I enjoyed the lovely view from your kitchen window. What a great scene to wake up to! Love it and with the stainless it is going to look fab !!! What are you thinking for backsplash…beadboard might work for you ??? Great job Linda and thanks for sharing !! Hooray! 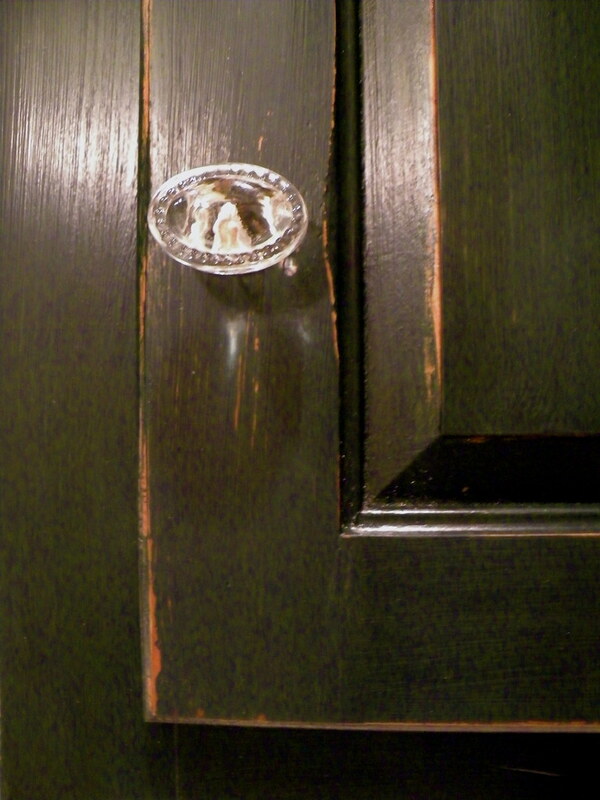 Love that you distressed the doors a little and the knobs are terrific… especially the ovals. And I like that the interiors are a different color. I wish I'd been less brain-dead while I was painting my kitchen cabs several years ago… painting them at all was daunting enough, I just didn't have it in me to imagine a different color on the insides! Linda, everything looks wonderful. You must be sooooo happy to have your kitchen back. It's looking good…what are you doing for the backspash? And, don't forget to get some great accessories for the countertop! Linda! What a transformation! You must be so incredibly pleased! The first image (with all that white china) belongs in a magazine. Lovely! Can't wait to see what you are doing with the backsplash. It looks beautiful, Linda. 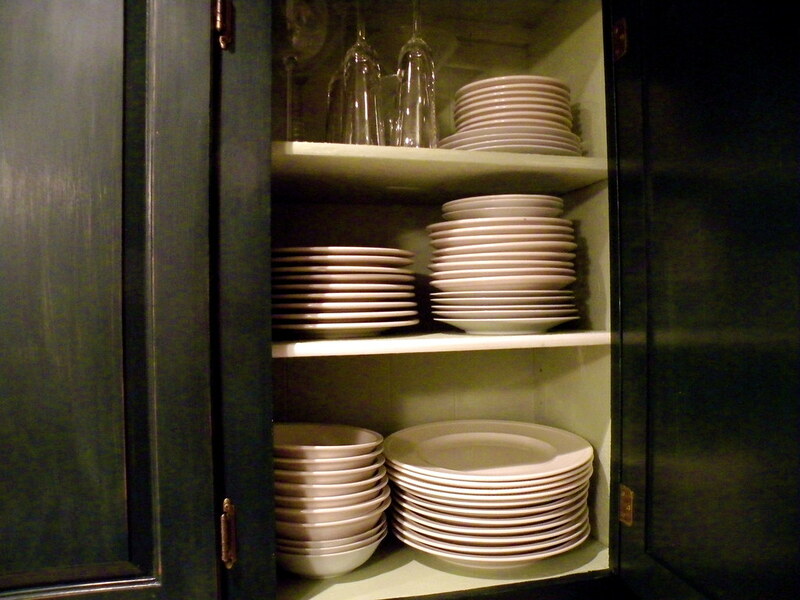 I really like the dark cabinet color with the crystal knobs and the light green interiors. Did you use latex/water based paint for the exterior? g'day Linda, so glad to see your kitchen coming along, I watch in the background… Love those knobs – wish I could afford them for my DS's bedside tables!!! I recently received a blog award which requires me to pass on the award, I've chosen your blog for obvious reasons, I'm a big fan! Check out this post and if you get time, I suggest you do it, because it was actually quite fun! Linda, it looks just beautiful!! All your hard work hsa so paid off and now you have a stunning kitchen, I love it!! I just love the paint technique you used with an undercoat of green and then black. 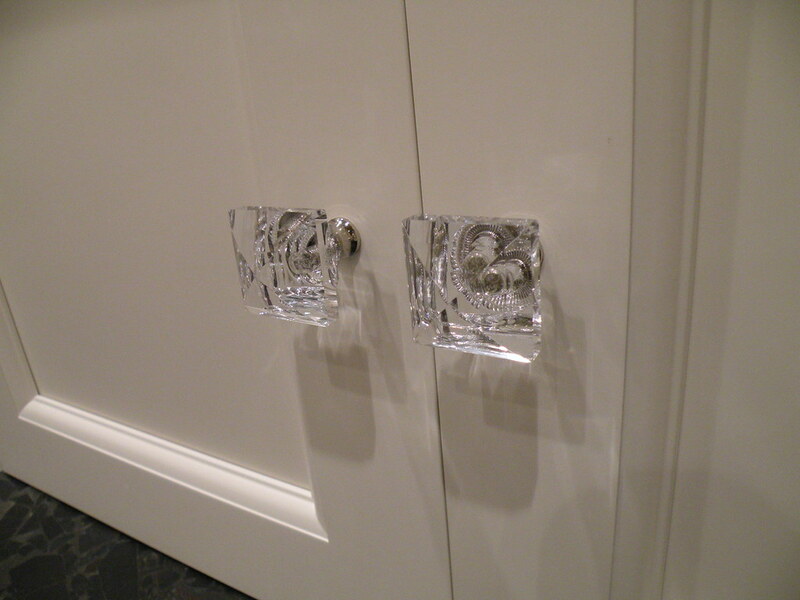 They look beautiful and I really love the crystal knobs. They look professionally done. Gorgeous.